One of the hardest things for me about joining EMM has been the budget. Both Nathanael and I have been blessed with jobs that we are able to work more or less dependent on family needs, or dare I say it wants. The process of the budget and approval has gone through. It is finalized. As I said before the amount in the budget, the bulk of it was determined by EMM. For me it was difficult to look at it and say this is it, this is the limit and it won't change for 2 years. It is hard to have someone else tell you more or less the way to spend your money. I am thankful. God is stretching me. This budget is actually more than I think I need, but I have no idea what a budget should look like while living in Belize, or even what our daily spending will look like. We still don't have a team leader, there are 2 other positions that need to be filled on our MST. I am being called in a greater way to prayer and trust. I realize that to see God work, I have to get to the end of "me". Awhile ago I came to the conclusion that I truly function at a "works mentality" with God at times. If I haven't completed what I think should get done, prayed the way I think it should look like, then perhaps I'm not of any worth, or God won't listen to me. This wrong God wants us to pray with an attitude of expectation, allowing him the divinity that he deserves. If I am only praying for things that I can do, I am not trusting that God is able to fill my every need. I don't have the confidence that he is who he says he is. I am thankful to him for stretching me. I can't wait to see the things he will do even in this part of the process. 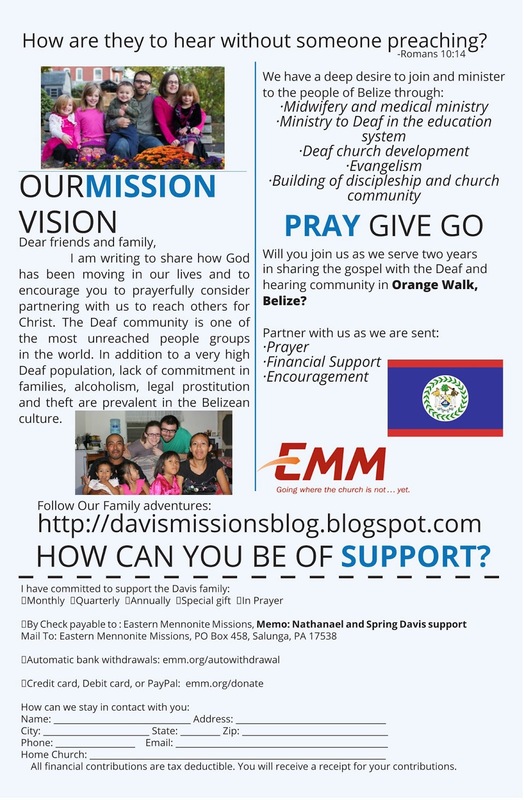 While our support letter is still in the works, we are officially in the "support raising" part of our trip to Belize. This part is the most uncomfortable for me. I have already seen that in this process of going, God has stretched me, and I expect that to continue. I worked at Esperanza, and began to see the value in having supporters. In fact right now, we support Esperanza every month. For one it causes people to think and pray about you more often. It brings both parties to their knees; a reminder to the supporter to pray, and the one in need to ask of God and trust his provision. Giving support also makes you feel involved in something greater than yourself. It is amazing to see what God does with willing people. I am doing my best to realize it isn't my job to go out and beg people for money. I share his vision, he stirs hearts. Last night we had a meeting with our MST. Some members were missing and some positions haven't been filled yet, but we were thankful for the people who came. It was very encouraging to be surrounded by people who believe in our vision and calling. People who are excited about standing with us on this journey. At the same time it was unnerving. We went over and approved the budget. This is the final step before we start fundraising...a step closer to leaving for Belize. The most interesting thing about this process for me is nothing was really decided by me: the budget is decided by EMM, the timing is based on the needs in Belize, and when we are able to raise 100% of the budget. This is a scary process, stepping into the unknown. It's not just stepping into the unknown for Nathanael and I but our children as well. By walking into this calling we are forever altering their lives (hopefully for the good) I do realize that many of the decisions we make, even sometimes lightly do alter their lives, this one just seems "extra big"
Please be praying especially that we find a team leader. This role is so vital, and as the MST coordinator stated, without the roles filled, we are like a bucket with holes in it. we've been e mailed about our training modules, and Nathanael and I are to find mentors. This week we go on much needed much awaited vacation! :) Hopefully we will come back renewed, refreshed and ready to work!